Today and yesterday, the BART Board is having a retreat and talking business over teleconference across the east and west bays. BART is considering to change their fare policies to make it more attractive than their basic system of mileage based fare with minimal discounts for adults for riding often. To review the documents, click here (PDF file). Additional documents are attached within the PDF file to review. Continue with usual fare increase every two years. Next increase would be 3.9%. Would raise extra $13 million. Establish a monthly pass under a zone based system. Loss of $10.5 million. Extend youth discount up to age 17 (currently ends at age 12). May stick with 62.5% discount or may reduce it to 50% discount. Loss of $4.6/3.1 million, respectively. Offer passengers who ride more than 40 times in a calendar month the privilege to ride BART for free for the remainder of month. Loss of $8.4 million. Increase capital surcharge by 10 cents, from 12 cents to 22 cents. Raise extra $8.3 million. 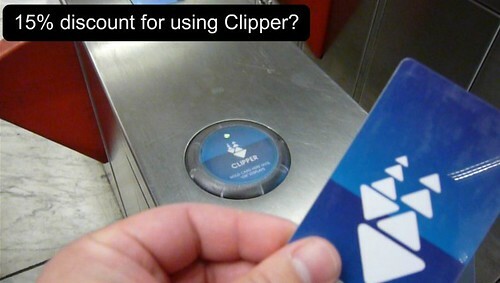 Automatic 15% fare discount to all Clipper card users. Loss of $22 million. Peak fare and off-peak discount; 15% fare hike on rush hours, 10% discount during non-rush. Raise $6.8 million. Lifeline program to those making less than $25,000 or $50,000 by offering a 50% discount. Loss of $16/$18 million, respectively. In a fantasy world, we would approve of all the cool benefits that we can take advantage, like extending the youth fare to up to age 17, monthly pass, the free rides after 40 rides, 15% discount for Clipper users, and the lifeline program. But in the real world, all those fantasy options comes at a cost to BART and taxpayers. The only way they could compensate for the losses is to raise fares. They already do a fare increase every two years, and would need to do a fare hike during peak transit times to encourage less crowding by having those take BART during non-peak hours, and increase the capital surcharge. In a marketing and PR standpoint, it would make BART look more attractive for many people. Passengers have been begging for a monthly pass system for the longest time, youth from ages 13-17 have been screwed over by not getting a youth fare discount while other transit agencies still offer it until they become 18, no need for high value discount tickets to ride BART as all Clipper users are eligible for the automatic 15% discount, and those with low income can save money. BART's current fare structure and rules works well for them as their farebox revenue generates over 50% of the agency's income. And in a time when the status quo works well, BART could be hesitant to change it. I feel their current fare structure is simple enough to understand, how far you go determines your fare, simple to understand discounts for youth, disabled and seniors, and high value discounts for adults. But even though the current fare structure is simple to use, it's getting old. People want rewards for being loyal riders, and there's very few incentives for people to use. The only few incentives for the regular commuter is using commuter benefit vouchers, high value discount tickets, and Clipper fare payment. BART used to offer a credit card that gave people free BART tickets for using their card on everything, including buying groceries, but that card disappeared. I like the idea of a monthly zone pass. People can benefit from traveling around the Bay Area without worrying if their Clipper card has enough money, and it makes it easy to budget a passenger's cost to ride BART every month and year. I also like the 15% discount for Clipper card users. It sounds like they want to follow in the tracks of Golden Gate Transit when they decided to give all passengers a discount to ride when using Clipper, versus having everyone buy GGT electronic zone based ticket books on Clipper. By having BART encouraging Clipper usage, the agency can save money on reduced maintenance on ticketing machines as they are used less often, and can buy less mag stripe tickets because people use a reusable and refillable Clipper card. Surely, I don't like the idea of a fare hike, but I have to sometimes accept that fact. As I am not a regular commuter on BART and stick to weekend rides, I would benefit with the 10% fare discount, but regular commuters would grumble at paying a 15% premium. But even then, the premium fare would be zero percent if BART offers the 15% discount for using Clipper. What's your thoughts about BART's proposals? Like them? Hate them? Leave a comment. Free rides after 40 is my personal favorite. Free leisure rides for commuters! This is the bane of US politics. This would "cost" BART money but save Caltrans MORE money in reduced road repair costs. If we did this, the analysis would show that "roads are more effective/cheaper than mass transit"